Yesterday, by the end of the day, I was feeling defeated by everything in my life. I felt like I was pretty useless as a mother, as a wife, as a teacher, and in all the other areas of life. I feel so much pressure to be better and I feel like I fail too often. After I left the house yesterday evening, because I couldn’t be a nice person to my family, I bawled and then called my mother. She has lived through so many hard things in her life and she continues to do all that she can to serve everyone around her and be pleasant. I felt some comfort in knowing that someone I love had survived difficult things in their life. I started to be convinced that I could get through my challenges. Knowing that I am a part of a family that overcomes and keeps trying helps me to face things with more strength and hope. Inspired by my sister’s example, we teach our children that Bowmans try and try again and can do hard things, along with a list of other ideas we want to instill in their characters. We are creating our family culture without teaching them that other families are wrong, just different. I heard Jane tell her little sister, “Maurie, Bowmans try.” It made me so happy that she is using and sharing the lessons we teach. Recently, I created an “ancestor” gallery wall and it has brought me comfort to see family members that have gone before me and left a legacy of love and service. I don’t see all of their hard times, but I see their smiling faces and remember the stories of victory and defeat that I have heard. Some of the family culture they created is being passed down to me and my children. In an article, “The Family Stories That Bind Us,” by Bruce Feiler, he shares the results of a 2001 study of children having conversations at the dinner table and then taking psychological tests. “The more children knew about their family’s history, the stronger their sense of control over their lives, the higher their self-esteem and the more successfully they believed their families functioned.” I want my children to understand who they are and who they are within their family. I have seen the value of understanding my ancestors; there lives have inspired me and guided my perceptions and resilience. Because grandma and great grandpa did it, I can too. Check out this blog post where I relate to family members that have shaped me. 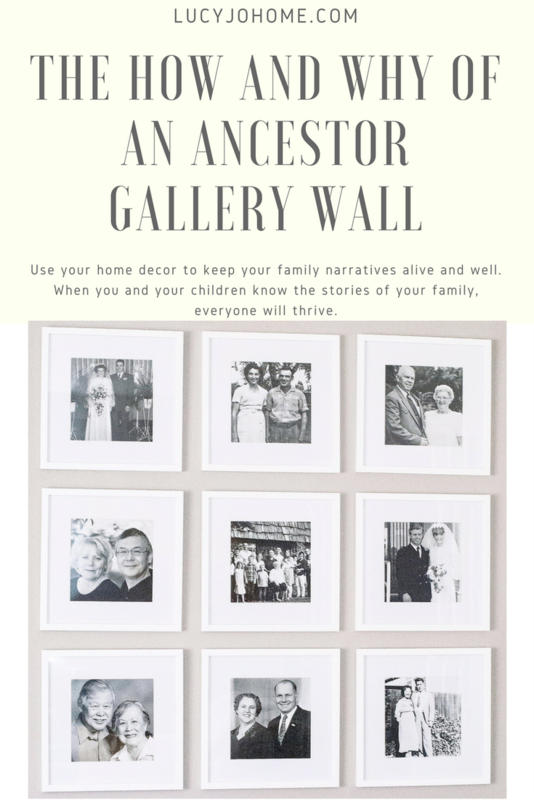 Even if you don’t have a ancestor gallery wall, spend time sharing the stories of your family with your children. Keeping the stories alive will help them and you in challenging times. “The single most important thing you can do for your family may be the simplest of all: develop a strong family narrative” (Feiler, 2013). I challenge you to share a story about your ancestors once a week this month, so pick four stories that have inspired you and share them with your family! I also wanted to share the simple process I took to create our ancestor gallery wall. This post contains some affiliate links for your convenience (which means if you make a purchase after clicking a link I will earn a small commission which helps keep my blog up and running but won’t cost you a penny more)! Click here to read my full disclosure policy. Pick frame sizes and colors that will look good in the room you intend to hang them in. I knew I wanted a uniform look and that I wanted white frames that would pop on my gray walls. Here is the link to the 9 Piece White Gallery Frame Kit that I used. Here is another one from Target that has 12 frames instead of 9, if you have more photos. Once you have chosen the frames and colors, pick the photos that you want to print. Size them to fit the frames and edit them to have the look you want. I wanted to have black and white photos to give a sense of the past. I did all my editing in Lightroom and Photoshop, but you could do it from your phone or use free software. I printed my photos at mpix.com, which is my favorite. Now it is time to put the photos in and hang the frames. We used a drill and a ladder to put the frames up. The gallery set came with a paper pattern to help with the placing of screws. I hope that the stories and lives of your family permeate your home and inspire you to continue living a life that will help your posterity continue the special legacies in your family.